We are a Spirit-led organic fellowship drawn together by God to evangelise. We are called to proclaim the Good News of Jesus Christ and to equip others for this task of evangelisation. In order to be a sign of hope and give an authentic witness we are committed to living the Gospel in ways relevant to the needs of today. 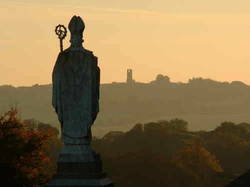 As we join St Patrick on his pilgrimage of faith, it is useful to remember the fire he lit on Hill of "Slane" Co. Meath. Very early in the life of the newly evangelised Irish people, some became known as "Céilí Dé" (The Community of God). Hence our logo of the hill of Tara, overlooking "Slane" and upon it the name Ceili. 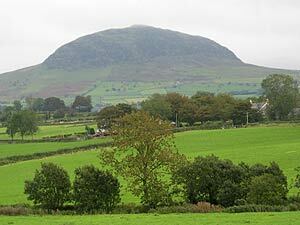 It is our desire as Ceili community to keep that fire blazing as a symbol of God's love for the people of Ireland. We firmly believe that in these days of uncertainty and so called virtual reality, we should go back to our own roots of Christianity in Ireland. So, conscious of the unique heritage bequeathed to us by our national Apostle, St. Patrick, we called our Community Céilí Naomh Phádraig (Companions of St. Patrick) or in short Céilí Community. We find that an awareness of the quality of soil in which St. Patrick planted the seed of God’s Word helps us appreciate the importance of the Christian faith in our country and gives us all a better understanding of the unprecedented harvest which he reaped in the teeth of enormous difficulties.